Warm up your look with this belted boot. Perfect for traipsing around town or in nature, this rustic suede boot comes pre-treated with Rust-Oleum® NeverWet, a superhydrophobic technology offering protection from rain, ice, mud — even accidental spills. So while your feet are staying warm inside the sheepskin and wool-blend interior, you don't have to give that snowdrift or puddle a second thought. 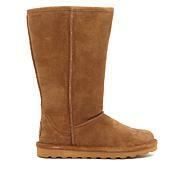 This is my 3rd and favorite pair of BearPaw boots. 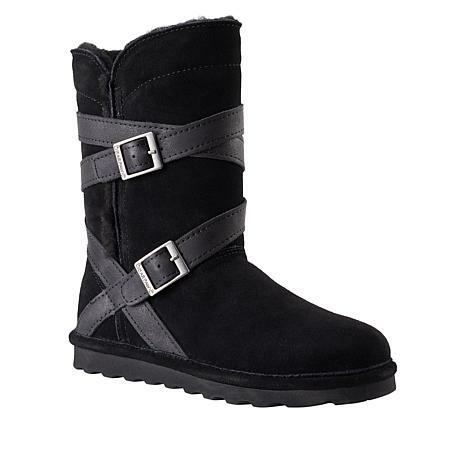 I love the mix of winter and riding boot styles in this boot! 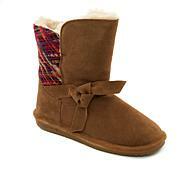 As with all BearPaw boots, these keep my feet toasty warm and comfortable. My feet havent been cold or wet all winter thanks to BearPaw. My husband thinks they look nice too. Very happy with my boots! Love these boots. Since I bought my first pair of BearPaws boots from HSN they are the only winter boots I wear. The contrast design on these are great. Very pleased. Perfect. I simply love these boots!!! 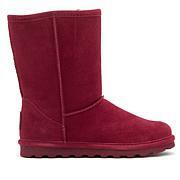 I purchased them for my daughter and she loves the style, fit, and warmth of Bearpaw boots. We're very happy with the purchase ,and the flex payments !! !